My partner Mike was a professor with a wealth of knowledge about all things nuclear. Of all the achievements of his long, illustrious career there was none of which he was more proud than playing a pivotal role in keeping nuclear power out of British Columbia in the 1980s. One of the last things he wrote before his sudden death in March 2011 was a column for our local paper about the fundamental flaws in producing nuclear energy which led, inevitably, to the Fukushima nuclear plant disaster. When a 20 metre-long dry dock washed up on the shore of Oregon in June, 15 months after being cast adrift by the Japanese tsunami, I could almost hear Mike asking: What about the invisible fallout from this disaster? After all, even though it wasn’t reported in the Proceedings of the National Academy of Sciences until May 2012, within five months of the Fukushima explosion scientists on the US Pacific coast found radioactive contamination levels ten times higher than normal in migrating bluefin tuna. Airborne radioactive pollution crossed the Pacific much faster than those tuna. An investigation by Georgia Straight last year revealed efforts by Health Canada to downplay the significance of massive spikes in radiation in BC and across Canada within weeks of the Fukushima nuclear plant explosion. By the time those radioactive tuna were turning up in California, Health Canada had already removed nine supplementary radiation monitors installed in BC and the Yukon following the Fukushima meltdown. According to their website, this was done because “radioactivity levels across Canada continue to be within normal background levels and there is no cause for concern”. So, we’re just getting our regular, everyday, perfectly safe dose of radiation. Well, that’s a relief, isn’t it? Or is it? Established as safety limits, eh? Established by whom? Dr Samuel Epstein, professor emeritus of the Chicago School of Public Health, has warned: “The claim that low doses of radiation are harmless has always been just a claim.” Mike and countless other nuclear experts (though not surprisingly none in the nuclear power industry) would agree: there is no risk-free dose of radiation. As Anna Tilman explains in Watershed Sentinel magazine, ionizing radiation (which all radioactive material coming out of a reactor produces) is powerful enough to initiate and promote cancer. A single radionuclide can cause a lethal cancer, and damage to DNA that may be carried to future generations. Just how much radiation is in the air you’re breathing? According to Health Canada, not enough for you to worry about. In case you don’t believe them, you now have a chance to find out for yourself. Watershed Sentinel (in co-operation with the BC Environmental Network and a private donor) has purchased a Geiger counter. The magazine wants to put the Geiger counter on the road, sending it to communities around BC and Alberta to test for hotspots. Results will be mapped and posted on its website. Details about borrowing and operating the Geiger counter are available at sentinelhotspots.ca/hotspots/radiation. 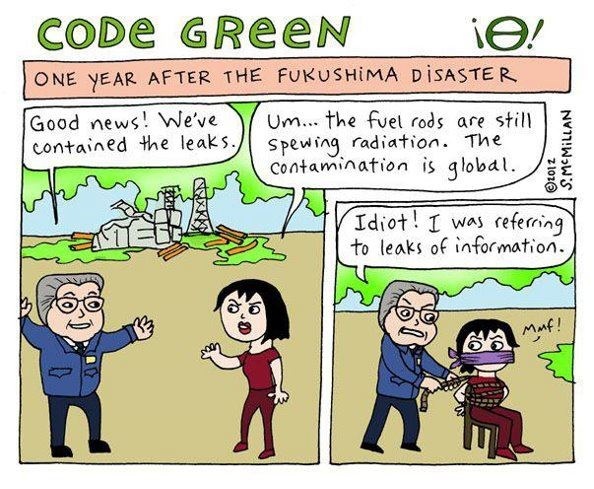 To see more of Stephanie McMillan’s excellent Code Green cartoons go to www.stephaniemcmillan.org/codegreen.